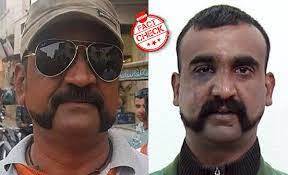 Viral post uses a picture of an Abhinandan doppelganger and claims that the IAF pilot has voted for Modi. A photo of a man purported to be Wing Commander Abhinandan Varthaman is going viral on Facebook with a false claim that the Indian Air Force pilot openly supported the Bharatiya Janata Party (BJP) and voted for Prime Minister Narendra Modi. The man in the photo sports Varthaman’s trademark handlebar moustache and a pair of Ray Ban sunglasses in addition to wearing a scarf with the party’s symbol of a lotus on it. The Hindi caption of the viral posts urge people to vote for the BJP. The post has taken the social media by storm and is being shared from several fan pages of the prime minister. The viral post can be viewed here and its archived version can be accessed here. BOOM tried to track the person seen in the viral image through a reverse image search without any success. However, upon examining the picture closely, we spotted glaring differences in facial features of the IAF pilot and his doppelganger. Abhinandan Varthaman has a mole below the left side of his lower lip which cannot be seen in the other image. There is a visible difference between the nose of the air force pilot and that of the man’s seen in the viral photo. Abhinandan’s nose is sharper than the man in the image. The man in the viral post has a mole below his right eye. However, Abhinandan has no such mole under his right eye. The IAF pilot lives in Chennai and is likely to be a registered voter in Tamil Nadu. The first phase of the Lok Sabha polls held on April 11 did not cover Tamil Nadu. As many as 39 Parliamentary constituencies of Tamil Nadu will go to poll in the second phase of polling on April 18. Also, the viral image shows a shop behind the IAF pilot’s doppelganger that has the words ‘samosa centre’ written on it. Signboards in Tamil Nadu are usually in Tamil or English.